Apple will announce the iPhone 7 on September 15 ahead of a September 25 launch date. 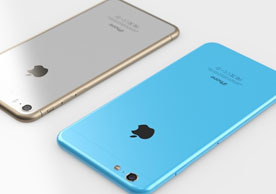 Last year, Apple simultaneously launched the iPhone 5s and iPhone 5c on Friday, September 20. The smaller 4.7-inch iPhone will be called the iPhone 6, while the bigger 5.5-inch "phablet" version of the next-gen "iPhone 6" will be called "iPhone Air."